Everybody who plays hockey knows that to make it to the big leagues you must have some Ice hockey skill. These skills, you must posses them perfectly to become a great player. However, what kind of hockey skills must you posses to achieve the NHL? Having agility is an important hockey skill, if not the most. The thing is that you do not really choose how agile you are going to be since it has a lot to do with your genetic makeup that will determine it. No matter how agile you are, there will always be some drill that will help you reach your full potential. In fact, by practising, you will become quicker to respond on the ice and that is a great advantage. Speed, especially in today’s game is very important. Most people believe that being able to skate front to back is enough. In a game situation, you will be skating in in many directions. This is why it is good to be a fast skater not only front to back but also side-to-side, around in sweeping or tight circles. You will have to change direction quickly and skate quickly from a dead stop. You will always need that extra speed when it comes time to go around a defenseman or in a breakaway situation. This skill is also very important when you must dodge a check or get out of the way of a flying puck. Flexibility is also very important for goalies. Goalies must bend like rubber in some situations. They must reach and stretch out to almost impossible positions in the crease to make that all-important save. Often the first save is not too bad, it is the second, third or fourth rebounds that will make you twist and turn in impossible shapes to stop that puck. Stick handling is pretty much the essential skill that both players and goalies will need. It is even truer for players. Stick handling will help you out player your opponents and even out play the goalie. There is no real secret to this skill except practice. You must always practice stick handling either on the ice or at home. Those passes some players make between the legs of an opponent and back to them selves does not come naturally. Playing smart usually, means that with some practice you will be able to predict what other players will do with the puck. For some it comes naturally, they say that they see the game in slow motion. As a player, you will make mistakes and good plays. A smart player will learn from his mistakes and make good plays out of them. You must learn to know what works and what does not. 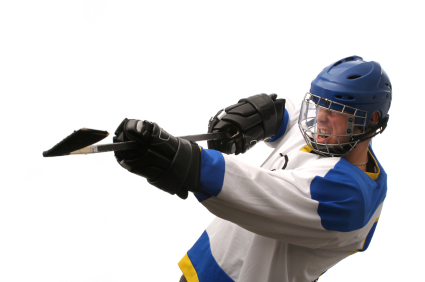 As with any skills, hockey skills must be practiced as often as possible. Even for players who might have these skills naturally, you will see that they are also the ones who practice the hardest.